IN ALL DIRECTIONS around me I can see nothing but an endless world of blue and green — water, mangroves, sky. There are no other boats or people, nothing but the wind blowing notes through my rod guides. Standing on the bow deck of a small motorboat, I scan the wide, sandy shelf for movement but see only mirages. Out on the flat, everything can look like a bonefish, while bonefish themselves can look like nothing. To amateur eyes, that is. “Look, way up there — four of them moving over that patch of grass. Big ones,” says my guide J. R. Delancy. He is a native, or a “belonger” as they say down in the Turks and Caicos Islands (TCI), and he has eyes like an osprey. I look for the fishy shape I had already seen several times that morning but that is different each time. Even though I didn’t even have the bonefish in sight yet, my hands tensed with the desire to make a cast. “They’re moving over that patch of sand,” J. R. says in his island accent. And then I have them: four big bonefish in spearhead formation, about 25 yards out, moving away at roughly 35 degrees. J. R. smoothly poles closer, but with both the boat and the fish in motion, it feels farther than I can cast without possibly laying the line directly over them. I make a short false cast to wind up. “They’re big ones,” J. R. says, as I fire out the shot. My fly lands just behind the fish. Ugh. But then one of them zips into a sharp U-turn. “Strip, strip,” J. R. says, in his heart trying to catch the fish, too. The bonefish hangs over the fly for what seems a long time in bonefish time — about a half second — then he spins around and rejoins his crew as the four of them hit the throttle. J. R. sighs quietly through his teeth. Had fate let us down, I ask myself, or is it the guy in the front of the boat? No matter. At that moment, with the bones fading into the blue and J. R. once again quietly leaning into his pushpole, I knew that this was just bonefishing — and just the beginning of an addiction. MY FIRST TASTE of this new habit came at Pine Cay, a truly unique place in the Turks and Caicos lying east of Provodenciales in the middle of a chain of cays about 90 miles north of Haiti. 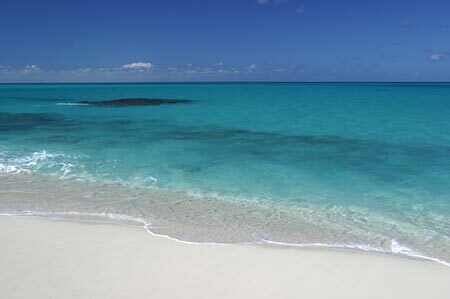 Pine Cay is a private island with an elegantly simple resort hotel, the Meridian Club, and a number of private homes. The resort and houses sit along a classic Caribbean beach on the north side, and the interior of the island is a preserve ruled by Cuban crows, iguanas, and innumerable frogs. The deal is this: Spend the time and the money for a stay at Meridian Club (see sidebar) and you get access to a wholly untrammeled bonefish wonderland out on the southeastern side of the cay. April through June is the best time to go because the bonefish school up then, and the chance of catching 15 to 25 fish in a day is very good. I went in December, and despite wind and steady cloud cover, I saw good numbers of fish in only two brief days of fishing. Although I had many chances, I ultimately had just … well, let’s say I had a low fish count. But when that breakthrough bonefish did take the fly, the afternoon exploded. We were fishing the edge of a flat obscured by clouds. As J. R. poled toward a sandy point, he said, “Blind cast out to the side. Strip it like there’s a fish right there.” The man was right. The running line burned a groove across the fingers of my left hand as the fish zoomed away. When I got him on the reel, he peeled off line as fast as a motorized spooler puts it on. I was using a reel that had been tested by numerous salmon, but this bonefish tested it farther — and faster. I recalled how researchers at Massachusetts Institute of Technology once built a robotic fish to try to understand why certain fish — barracudas, pike, tuna — can pull forces that their anatomy does not seem capable of producing. Perhaps these slime-coated, wedge-shaped bodies create a superfluidity as bone fish slide through the water, generating less friction the faster they go. Or maybe it’s the spade-topped head, shaped like an alloy fender and parting the water in a way that creates a partial blank space; a vacuum into which the bonefish can suddenly accelerate from zero to Mach 2. In any case, I say to the speed researchers and rocket scientists the world over, start studying bonefish. They possess their own hydrodynamic secrets. At about Mach 3, my fish cut the engine and mooched around a bit. I got some line back, but then he flew again. In all, he made three classic runs that were just marvelous, arcing wide away from the boat with J. R. ducking under the line as I turned through every degree of the compass. J. R. netted him, and the fish was not big, maybe three pounds, but he was picture perfect and had done with gusto everything a bonefish is supposed to do. I happily released him. “What’s the biggest one you’ve caught?” I asked J. R., who has been guiding for bonefish for twenty-some years. I could only imagine the speed and fury of a 12-pounder. Looking out at the sea — an emerald swath topped by a layer of blue-green and a final, burning seam of white beneath that huge sky — I felt the need for another bonefish fix creeping up in me. Tackle: Take three rods: a fast 8-weight and a mid- to fast-action 9-weight for the bonefish; and a fast 10-weight for small blacktip sharks and barracudas. Load your reel with a good bonefish-taper fly line connected to a 10-foot leader with an 8- to 10-pound tippet. Take along some wire leader material for the sharks and barracudas. Flies: Carry a box of Bread-and-Butters in pink and brown, Crazy Charlies in white-and-brown, tan-and-pink Puffs, and pearl Christmas Island Specials, all in size 6 or 8. Also pack a variety of small crab patterns. 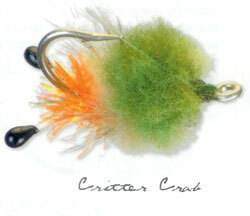 TCI sharks and ‘cudas fancy saltwater streamers in white and green with lots of silver Mylar. Clothes: Take wading boots and full-covering hot-weather clothes, plentiful sunscreen and lip balm, and two pairs of polarized sunglasses (one as backup). Getting There: You can fly direct to Provodenciales from New York, Charlotte, Atlanta, and Miami. I flew American Airlines round trip from JFK for around $600 on short notice. Global Airlines takes you from Provodenciales Airport to Pine Cay in a twin-engine Piper Aztec for $150 each way. It’s a fun, 10-minute hop. DESPITE the seeming abundance of bonefish around Pine Cay during my trip, knowledge of overall TCI bonefish stocks is somewhat limited. 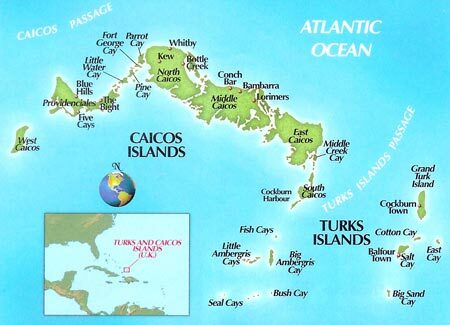 Currently, the TCI Department of Environmental and Coastal Resources has a tagging program to determine the size of the fishery, as well as whether there is any genetic difference from the larger Caribbean population and if the fishery has enough protected habitat. The bonefish tagging program began in January and goes to January 2008. Two Marine Protected Areas have been established specifically for bonefish, and no fishing of any kind is allowed in either one. But netting bonefish on a subsistence level is legal in a number of areas and will likely remain so. Despite bearing such an unpalatable name, bonefish are in fact favored by TCI natives for their sweet flesh. Although there is currently no management plan in place for bonefish across the TCI, Wilson says that the ongoing research projects do have both sport-fishing as well as subsistence-fishing management goals. EACH NIGHT I fell asleep under the breeze of a ceiling fan, dreaming about the fish that I had seen, cast to, and missed. I could not complain about a lack of shots, only my success in making them count. Early on the first day, J. R. and I had been wading a flat when a medium-size bone approached us head-on as a diamond-shaped shadow. I plopped the fly in front of him. He swam to within inches, then turned away and disappeared. Later, we saw another school of bones finning in the mangroves. “Are those sharks or bonefish?” J. R. asked, the only time he ever sought my confirmation on anything having to do with eyesight. Perhaps it was a test. I was sure they were bonefish, and said so. The numerous little blade-tip sharks I had been seeing did not resemble what I now saw. Soon enough J. R. said, “They’re coming out,” and the surface crested in an oval ripple. I guessed where the fish might be going, and how far ahead to cast. But when the fly popped the surface tension it landed right on them — too accurate this time — and the water exploded with a dozen 180-degree turns. On the second morning, J. R. poled stealthily along an island toward two lunkers. Bones with shoulders and guts. Linebackers. I cast to the forward fish hugging the coral edge. He instantly jerked toward the fly and pointed his snout at it, but he refused the rest of the plot. Was the fly too brown? Too light colored? Was I born with bad genes? No matter. It was all very good. It grabbed the soul. At one point during my stay, I met a TCI belonger who, as a boy, used to handline for bonefish. He’d told me a bonefish is so smart that if someone ever catches one in a fish trap, the event is considered such a horrendous anomaly that it is a sign someone is going to die. I would add that if a novice ever catches one on a fly line, it means that he has left the normal human realm to join what the pioneering angling writer Van Heilner described back in the 1930s as “a select fraternity of maniacs,” who get a “kick and thrill” out of a kind of dementia, a bonefish addiction. And that, in turn, means he has no choice but to go back again and again.